← Fashion Designers Beware! Amazon Goes Glamazon! That got us to wondering who was paying whom. So we started poking around . . . 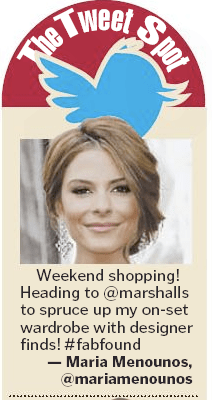 This entry was posted in Uncategorized and tagged #fabfound, Boston Herald, Fabulous Found Fashion Tour, Inside Track, Maria Menounos, Marshalls, Sneak ADtack, The Tweet Spot. Bookmark the permalink.